While brainstorming creative ways to save money on baby stuff, a friend recently blew my mind when she said that Little Swimmers and other disposable swim diapers can be washed and reused! While I'm kicking myself for not knowing about this two years ago when we started taking Haiden in the pool, I'm SO happy I learned this before summer starts here in Minnesota! Only wash wet swim diapers. If your little one pooped in it, it's best to throw it away. When you're ready to wash, just toss the diaper in the washing machine along with the rest of your laundry load. Let the swim diaper air dry. If you put it in your dryer, it will get hard and crunchy from the heat. 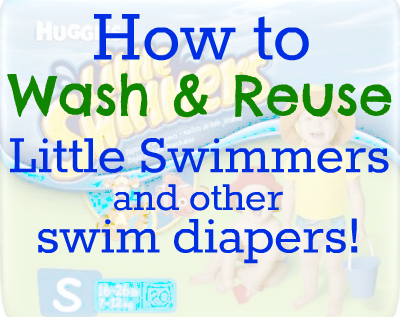 Reuse your swim diapers until they start falling apart! I've learned that most swim diapers last for around three washes, but they can last longer! Did you know that you can also buy 100% reusable cloth swim diapers? 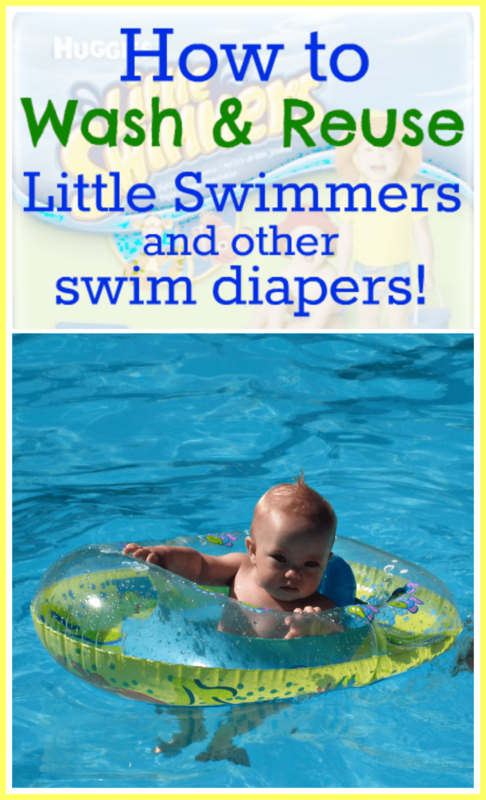 Here's a post I wrote a while ago on how to save money on swim diapers by using reusables! Your Turn: Do you ever wash disposable swim diapers? I made two swim diapers last all summer last year. Too bad that I can’t just purchase a small package of one or two. I can’t believe that, I missed out on that idea! My son is 4 and we no longer wear swim diapers. I thought they were full of water and ready to be thrown away! I will have to link to this post on my personal mom blog. This post is an excellent, money saving idea!! It was always such an expense to buy those swim diapers! Rewashing them needs to be shared with money saving moms everywhere. Thanks for posting! Um…why wouldn’t you just buy actual reusable cloth swim diapers, if you’re just going to reuse the disposable ones? The cloth ones are so much nicer and sturdier, and a TON cuter! I was going to post what Robin did. I love our iPlay swim diaper. I think I got it for around $10 on amazon. I can’t believe I never thought of this either! Some places do let you buy 1 or 2. There is a splash pad at the local aquarium and they charge $3 for a swim diaper because they require they be worn while playing. Keep your eyes open, you can find them! I actually washed one on accident and realized it was fine, now I wash them whenever I remember! Walmart has actual reusable diapers for only $5. That’s what I got for this year! No I wouldn’t wash a disposable swim diaper when I can, and do, use cloth diapers, including in water because swim diapers don’t absorb pee they absorb the pool. If you are going to wash them you might as well use cloth. If not then I would toss them because to me washing a disposable swim diaper is like washing plastic, disposable utensils, defeats the purpose. That’s pretty gross. Disposable diapers don’t have elastic that is made to be reused making it very likely that poop will leak out if it is reused this way. Why not buy a cloth swim diaper that will hold in the mess and costs less than a package of swim diapers? Robin, that’s EXACTLY what I was thinking! I’m going to echo the others. If you’re going to wash them anyway, wouldn’t it make way more sense to get diapers MADE to be washed and reused? I love my cloth diapers (both regular and swim) and am so glad I made the switch. That is amazing! I will have to share this on my blog about how to save money! Crazy cool! The washable swimmies make more sense to me but I didn’t know about them before and we currently have a new pack of disposable swimmies. So I will use these and wash them for now and when I run out, I will invest in one or two re-usable swimmies. Thanks for the information, though! We have a single reusable cloth swim diaper. i dont see how this can save money because you will have to throw it away after 3 washes. when you can buy a cloth swim diaper that was meant to be re used and washed. and then you can pass it on to the next child. AND using cloth is more money saving. creative thinking though. What an absurd idea! I agree that this is the same as washing plastic cutlery or paper towels. Why would you do that? If you want to reuse a product, don’t buy the disposable version and reuse it. I don’t mean to be rude, but this has to be the most ridiculous thing I have ever heard in my life! Do you buy disposable bibs and wash those too? Why don’t we just buy disposable clothes and wash those? We prefer cloth swim diapers at home, BUT when we’re on vacation at a hotel or some place where I don’t plan to do laundry, I usually use disposable swim diapers. In my experience, they don’t absorb anything at all; the goal is just to keep poop contained, so if it still looks clean, we just rinse it in hot water and reuse it the next day. ya..gross..im not a fan of cloth..ill jsut stick with using a new disposable one each time we go for a swim..one pack should last all summer for me..if not longer..we dont have a pool so we rarely use them anyway.. I have cloth too, but I DO see a point in reusing the disposables. If it’s poopy, you can toss it! If cloth is poopy, you have to deal with it. Ok I might be way off base but can someone tell me again what is so wrong with buying plastics plates/utensils and using them and then washing them??? It saves me money to have my kids be able to reuse these products as often as possible especially when they CAN be tossed when needed and with us being sensitive to having regular utensils in our mouth. For those of you being so judgmental about buying the disposal version of products and reusing them, ummm isnt that a good thing. Reduce REUSE recycle?? We use cloth diapers on my 1 year old daughter, so when I decided to find a swim diaper I immediately thought of cloth. I bought at cloth swim diaper at Wal-Mart for $5. Way cuter than a disposable swim diaper and actually made to be rewashed many many times. wow people…. if you don’t find the tip useful or helpful- move along. its that simple. i think that this is a wonderful idea to help stretch a dollar as well as not be (so) wasteful by using them up to two additional times per diaper before having to dispose of them. I know that Baby GoodBuys was really trying to help out with this tip. I appreciate it!! Personally, I truly admire those people who use cloth diapers. I really do, but I can’t deal with the poop factor. I feel lucky that I had the option to toss poopy diapers in a neat little package, and that’s why I would continue to use disposable swim diapers. For me, it’s nice to be able to wash and reuse a swim diaper that’s simply wet, but I still want to throw away anything solid in there! I’m going to echo what Mandi said… when we are on vacation, I don’t have time to worry about cleaning up a poopy swim diaper. I would much rather just toss it and move on. I even didn’t realize swim diapers would continue to hold up through a second wear, but I will definitely be reusing them from now on. Thanks for the tip! This is asinine! Just buy a reusable “cloth” swim diaper. You just dump the poop in the toilet and move on. Washing a paper diaper is really a dumb way of “saving money”. I use a reuseable swim diaper that I bought for 10 dollars, which is the cost of the throw-away packages. I have used the throw away diapers, but I hate them. I’d never wash them and use them over again, that’s sort of beyond where I’m willing to go to save a few bucks. I’m surprised at how many mamas have issues with ‘the poop factor’ 😛 It’s just poop. Everyone poops! All you do is rinse it off into the toilet, wash it and move on. Super easy, saves money and keeps away all the funky chemicals. I have done this for years! They last a few washes. And before the cloth is best posters bash me, we do cloth diaper. We also have cloth for our own baby pool. However, our city pools, gym pool, waterpark attractions and neighborhood pool all require a disposable swim diaper. So yes, this tip is beneficial. Cloth is great, it is not for everyone and I respect that. We are way beyond that stage, thank goodness!